Taken as a supplement, 5-hydroxy-L-tryptophan is the direct precursor to serotonin. Compared with antidepressant drugs like Prozac, 5-HTP has been found just as effective for depression, with far fewer negative side effects. It is also known as 5-HTP, 5-hydroxytryptophan, oxitriptan and trade names like Cincofarm, Levothym, Levotonine, Oxyfan, Telesol, Tript-OH, Triptum. 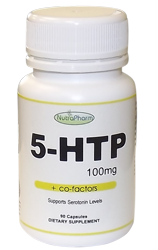 5-HTP requires the co-factors Zinc, Vitamin B6, Vitamin B3 and Vitamin C to assist the body to convert it to serotonin. Our capsules contain a 100mg dose of 5-HTP, along with all the required co-factors at the correct amounts to aid the body to convert the 5-HTP to serotonin. 5-HTP is commercially produced by extraction from the seeds of the African plant, Griffonia simplicifolia. Some mood elevation effects are often reported within 30 to 90 minutes. However, it may take two to four weeks for a clinical response to occur. Do not take 5-HTP for more than three consecutive months without consulting your doctor. Each capsule contains: 5-HTP: 100mg (extracted from the Griffonia simplicifolia seed) + co-factors: Zinc, Pyridoxine (Vitamin B6), Niacin (Vitamin B3), Ascorbic acid (Vitamin C). Dosage: For best results take 1 – 3 capsules everyday, with meals (or as recommended by a health-care practitioner). Each bottle contains 90 capsules. Warnings: 5-HTP should be used with caution in an individual currently being treated with an SSRI antidepressant. If pregnant, nursing, or trying to conceive, consult your doctor before using this product. Do not take 5-HTP for more than three consecutive months without consulting your doctor.